Kevin Harvick started third and finished first, collecting 10 bonus points and one playoff point. The No. 4 Jimmy John’s Ford raced to the lead by lap 20. Harvick pitted for four tires and fuel during the competition caution on lap 30. The Jimmy John’s driver led the remainder of the stage. An equipment malfunction on the pit stop following the stage caused a slow stop and forced the team to make a second stop to ensure the tires were installed correctly. Earned a playoff point for prevailing as the victor in Stage 1. Started 19th, finished fifth and collected six bonus points. Harvick drove back to the lead by lap 125. The Jimmy John’s team came to pit road under green for four tires and fuel on lap 127 and reclaimed the lead on lap 132. The team came to pit road for four tires and fuel on lap 160 and came out in the second position. Harvick fell from second to fifth on the lap-162 restart. Harvick pitted on lap 212 from second place for four tires and fuel, but a fast racecar enabled the driver of the No. 4 Jimmy John’s Ford Fusion to take the lead on lap 226. Harvick made a green-flag pit stop on lap 252 for four tires and fuel. Once green-flag stops cycled through, Harvick was back in the lead by lap 266. After leading for several circuits around the 1.54-mile oval, Harvick gave up a 12.5-second lead to make yet another green-flag pit stop for four tires and fuel on lap 287. He reassumed the lead on lap 290. A caution on lap 298 allowed Harvick to pit on lap 300 for four tires and fuel. He won the race off pit road and maintained the lead to the end, winning the Folds of Honor 500. Harvick’s victory in the Folds of Honor 500 marked the 44th overall win for Stewart-Haas Racing (SHR). It was the organization’s 40th points-paying Monster Energy NASCAR Cup Series win and its second at Atlanta. Tony Stewart won at Atlanta on Sept. 5, 2010. This was SHR’s fourth NASCAR Cup Series victory with Ford. The team won its first race with Ford when Kurt Busch captured the 2017 Daytona 500. 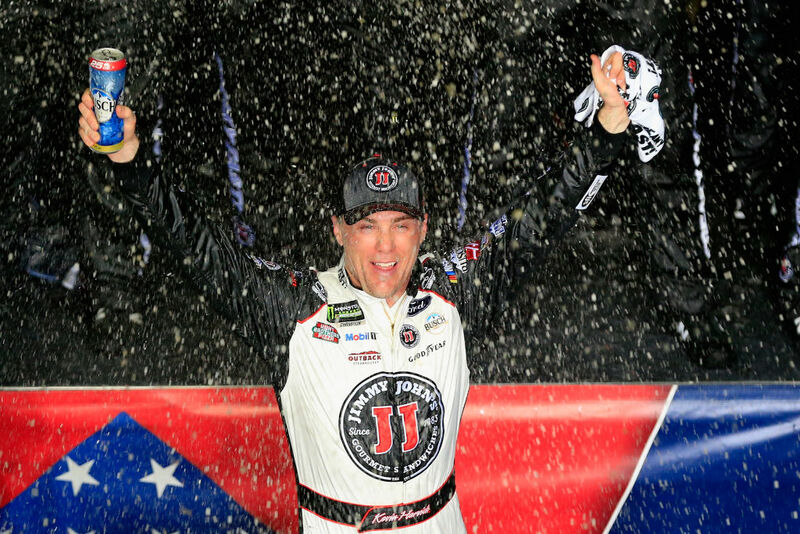 This was Harvick’s first NASCAR Cup Series win of 2018, his second at Atlanta and the 38th of his career. It was his 15th NASCAR Cup Series victory since joining SHR in 2014. Harvick’s margin of victory over second-place Brad Keselowski was 2.69 seconds. This was Harvick’s second win, seventh top-five and 13th top-10 finish in 28 career NASCAR Cup Series starts at Atlanta. Harvick’s previous win at Atlanta was on March 11, 2001 – his first-ever win in the series. He scored the victory on what was just his third career start in the NASCAR Cup Series. With the win Harvick earned five playoff points. He finished first in Stage 1 to earn 10 bonus points and one playoff point. He finished fifth in Stage 2 to earn an additional six bonus points. Harvick led eight times for a race-high 181 laps to bring his laps-led total at Atlanta to 1,152. There were five caution periods for a total of 28 laps. Thirteen of the 36 drivers in the Folds of Honor 500 finished on the lead lap. The next event on the Monster Energy NASCAR Cup Series schedule is the Las Vegas 400 on Sunday, March 4 at Las Vegas Motor Speedway. The race starts at 3:30 p.m. EST with live coverage provided by FOX TV, PRN and SiriusXM Radio channel 90.